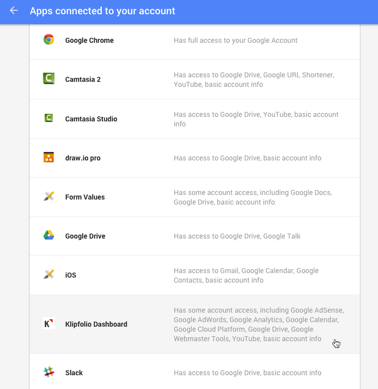 Klipfolio asks for these permissions to allow the Klipfolio app to connect to your data. Without this permission, you will not be able to use your data in the visualizations you build or retrieve data to store in metrics. 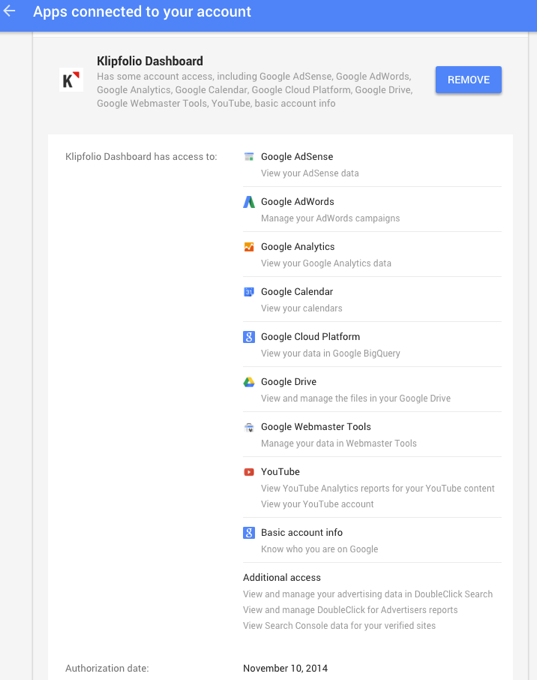 Also keep in mind that when you first authenticate with Google (say, for a Google Analytics Klip) you'll notice that Klipfolio may ask for permission to access YouTube. However, we won't actually access YouTube data until you create queries against YouTube. By asking for it when you first authenticate, it makes it easier for you to connect to other Google Services later on. For data sources and modelled data sources, the data is not placed in long term storage. Each refresh replaces the data. For metrics, each refresh of the underlying modelled data source results in additional data associated with the metric being incrementally added to the history of the data and stored securely in Klipfolio. When creating a metric you define the columns of data from the source that you want Klipfolio to store. You can contact our Support team at support@klipfolio.com and request the permanent deletion of your stored metric data at any time. For more information, please review our Privacy and Security policies.